Welcome to Music Friday when we bring you inspirational songs with jewelry, gemstones or precious metals in the title or lyrics. 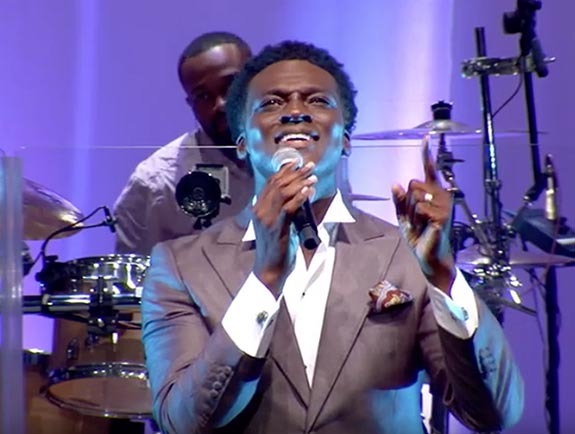 Today, contemporary Christian artist Duawne Starling sings his wedding vows in the 2001 release, "With This Ring." In the first verse, Starling describes the wedding band as a "circle of trust" and a symbol of his commitment to cherish his bride for a lifetime. He sings, "With this ring / With this circle of trust / I confess that I must be in love / With this vow / I can promise you now / to be more than you've ever dreamed of / With my heart in your hand / and faith in His plan / and with patience to last a lifetime/ I offer you everything / with this ring." "With This Ring" appeared as the first track of the wedding-song compilation album of the same name. Billed as a unique, romantic collection of inspirational love songs, the album spawned a second album by various artists called With This Ring... Forever I Do (2002). Born in Petersburg, Va., in 1970, Starling immersed himself in music after his father died of cancer when the youngster was only seven. "It was then that music became my sanctum, my escape from that reality,” Starling stated in his official bio. "Now, it's simply my passion." Starling worked as a background artist for 10 years before stepping forward as a soloist. He developed his talents touring with the likes of Michael Jackson, Patti Austin, Dolly Parton, Michael McDonald, Kelly Price and CeCe Winans, among many others. Starling’s inspirational music shares the triumphs and trials of his journey through life. Written and performed by Duawne Starling. I confess that I must be in love. to be more than you've ever dreamed of. You're the answer to all that I've prayed. then I am in heaven and you're perfect to me. With my ring, Will you stay. and ever, and ever and ever. 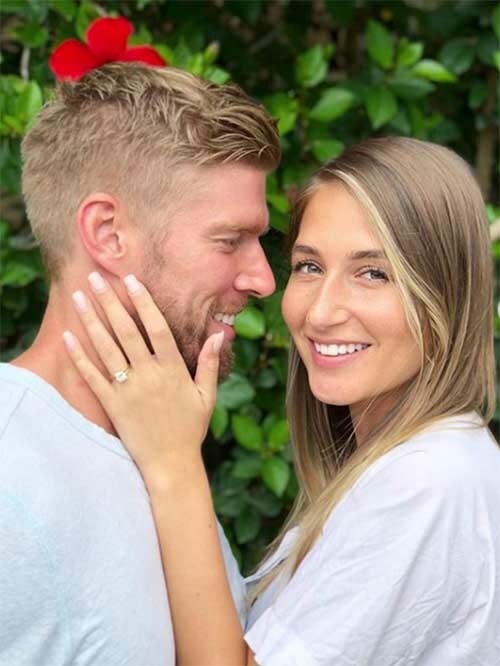 Bravo's Summer House reality stars Kyle Cooke and Amanda Batula confirmed their engagement on Instagram with a selfie of her gorgeous new ring. Cooke recently popped the question with a 2.5-carat diamond set on a yellow gold, split-shank band. Cooke told Bravotv.com that the diamond is cushion cut. 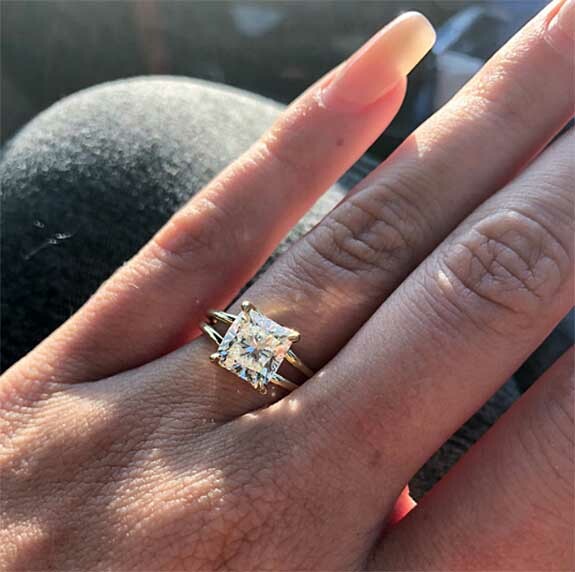 Based on the photo, above, we're pretty certain it's a princess cut. Nevertheless, Batula told People magazine that she can't stop staring at it. When Cooke enlisted the help of New York-based jewelry designer Stephanie Gottlieb, he already had a pretty good idea of the type of ring Batula wanted. Although she didn't expect him to propose for another year or so, she did prepare him with photos of the styles she liked best. Cooke and Gottlieb worked together to incorporate the design elements into a totally unique keepsake. “It’s beautiful. He did a good job," said the 27-year old graphic designer. "I look down at it and still can’t believe it’s my ring on my finger. When friends would get engaged in the past, I’d try their rings and you sort of get an idea about what it would be like if it was yours. But it’s so different when it happens." The attractive couple first met in 2015 and have been dating for two years. Despite all the hoopla surrounding their engagement, Batula and Cooke are not ready to set a wedding date. Summer House fans have been following the couple's relationship throughout Seasons 1 and 2 of the reality show, which takes place in Montauk, N.Y., an affluent beach town on the easternmost tip of Long Island. The Summer House cast includes nine friends who work in New York City and share a beach house on the weekends. Credits: Images by Amanda Batula and Kyle Cooke via Instagram/ImKyleCooke. 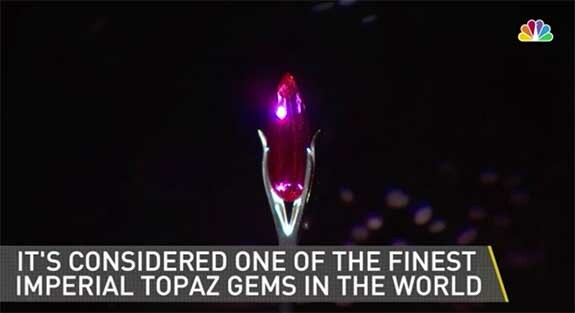 An extraordinarily rare 48.86-carat vibrant red topaz is the newest member of the Smithsonian's National Gem Collection. 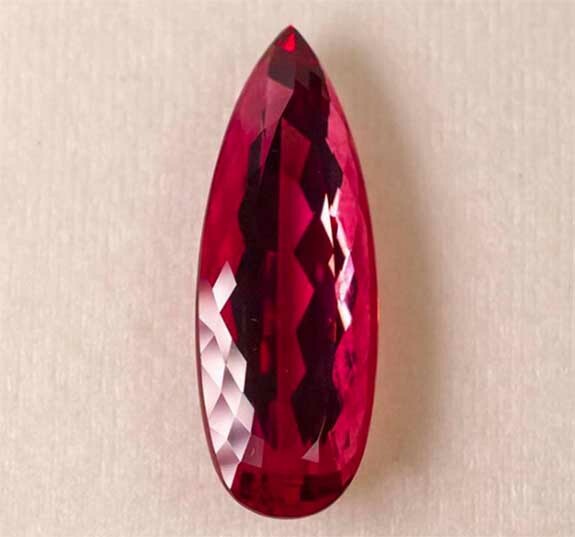 The teardrop-shaped gem, which was acquired for the museum by philanthropist Coralyn Wright Whitney, made its debut this past Thursday at the National Museum of Natural History in Washington, D.C. Dubbed the "Whitney Flame Topaz," the gem is described by Smithsonian curators as one of the finest examples of imperial topaz in the world. Imperial, or "precious," topaz is typically golden-orange in color, but the vivid red hue of the Whitney Flame is even more unusual and highly prized. The red color is the result of trace quantities of chromium that were incorporated into the original topaz crystal as it grew in the earth. The Whitney Flame was sourced more than 50 years ago at the topaz mines of Ouro Preto, Brazil. The unusual red topaz was held privately for many decades, before emerging at Arizona’s annual Tucson Gem and Mineral Show, a massive showcase that draws buyers and rockhounds from all around the world. When Post and Whitney viewed the stone for the first time this past winter, the uniform red color captivated them and they instantly knew they had a winner on their hands, according to Smithsonian.com. Whitney purchased the stone and gifted it to the Smithsonian, along with a $5 million endowment. In 2013, Whitney provided the National Museum of Natural History with its largest education donation to date: a $13 million gift in support of Q?rius (pronounced “curious”), which created the Coralyn W. Whitney Science Education Center. 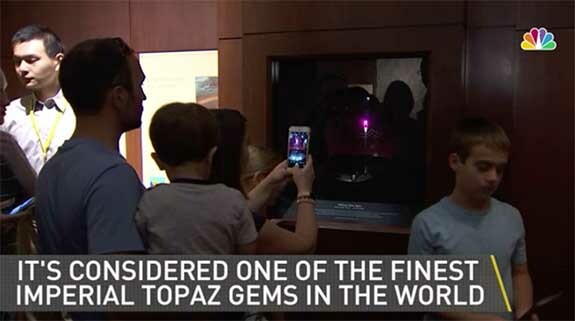 On Thursday, visitors to the National Museum of Natural History were the first to see the "Whitney Flame Topaz." It occupies a display case all its own in the gallery occupied by other famous gems, such as The Hope Diamond. The gem is positioned vertically and backlit to emphasize its fiery color. The Smithsonian’s gem and mineral collection, with 10,000 gems and 375,000 mineral specimens, is one of the largest of its kind in the world. The museum is open daily from 10 a.m. to 5:30 p.m. (closed Dec. 25). Admission is free. Credit: Photo by Donny Bajohr, Smithsonian. Screen captures via NBCWashington.com.